A Warm Welcome from Phil Martin "the Approachable Property Expert"
Property Investment, Property Development and Property Management. You can contact Phil Martin using this form. Most of Phil's popular blog articles or videos are usually inspired by questions from other people. ﻿"Thank you very much for all your help, advice and support with this transaction as we would not have been able to pull this off without you. This transaction has really tested my perseverance and patience and widely increased my knowledge as we have had to overcome practically every possible hurdle. Feel free to use the above as a testimonial if you wish." "What a fantastic couple of days! Thank you all so much for all the info and enthusiasm - and especially Phil for finding the potential Lease Option in SW18. Looking forward to many successful deals together." Debbie Wagstaff, London"
I hear and see that things are going well for you again. From all reports you are inspirational ! "Phil Martin saved my father's house just like he said he would, and I cannot thank him enough, as I would never have had the courage to do this with out his support. Thank you Phil." Joanne from S.Wales"
The property world would be a lot worse off without the vast knowledge you give so freely to us. 10/09/2015 "I met Phil for the first time this week although I have known of him for many years. He had lots of good advice based on his experiences of how to protect yourself against losing money on loans and JVs. I also know someone who has received some of his money back from Phil since his bankruptcy was discharged, and Phil certainly doesn't legally have to do that. 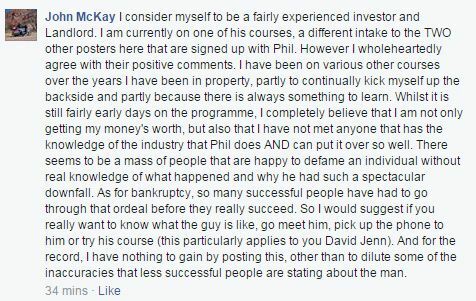 I regard Phil as a good guy who's made a couple of mistakes, and certainly someone who knows a lot about property. "I have recently experienced some financial difficulties which have jeopardised my ability to service my liabilities on both my home property and buy to let portfolio in the short term. I spoke to Phil and he took the time to provide me with some clear guidance and advice which has helped me to formulate a game plan for the next few months, when my situation will hopefully improve - Thanks Phil - Andrew". Phil, you just seem to go from strength to strength. "The Richard Branson of the property industry". Best wishes with your new acquisition. Regards David. "You are one of the few true entrepreneurs i have ever met and your resilience in the face of current and previous attacks from so called gurus is a lesson to us all." "The way Phil contributes to the property business is very professional and I wish him the best of luck in his new venture. Well done,"
All testimonials are genuine and independent with originals retained on file. the strapline "property, business, self development" are SM, TM and © 2014 and SM, TM and © 2015 All Rights Reserved. and complete but the information provided is general and does not constitute legal or investment advice. Watch Phil's Fun and Inspiring Property Investment Training Videos Here!